A camera mounted on the end of the rover’s robotic arm captured dozens of individual frames of the rover and its surroundings. Scientists normally use the arm-mounted camera — called the Mars Hand Lens Imager, or MAHLI — to detect features in close-up views of Martian rocks. But the robot arm can double as a selfie stick, and the camera scans across the rover to collect multiple views that image analysts on Earth can stitch together into a self-portrait. The wrist joint on the rover’s arm keeps the appendage out of frame in all of the images used in the mosaic, but the arm’s shadow is visible on the ground. 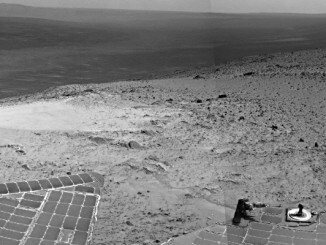 The sample collected 30 July is the seventh specimen gathered from boring into rock with the rover’s percussive drill, and the first since a glitch sidelined the drill in February. Scientists hope to analyze the samples with Curiosity’s internal instruments, which comprise a miniature laboratory with ovens, lasers and other high-tech devices, to find out why the region around the Buckskin drill site contains higher levels of silica and hydrogen than other terrain explored by the rover. 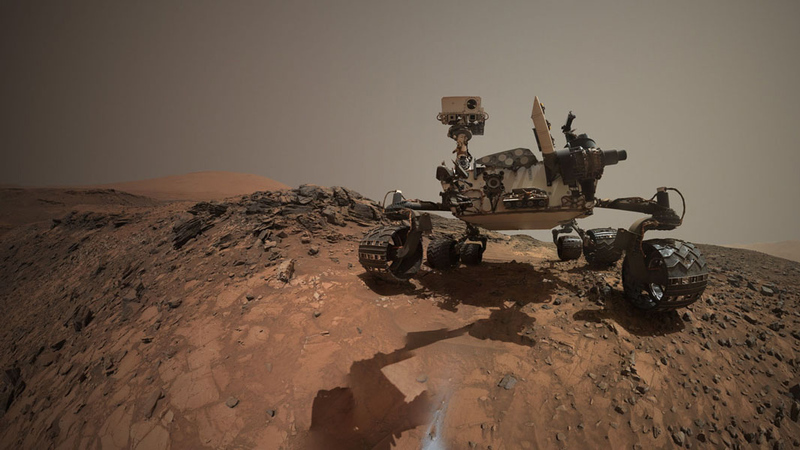 Curiosity began its fourth Earth year on the red planet 6 August, and its plutonium power source is expected to provide stable electrical supplies for the next few years, according to Ashwin Vasavada, the rover’s project scientist at JPL. “We think we have at least two, three, or four very productive years left, and then several more years after that as the power source degrades,” Vasavada said in remarks to the NASA Advisory Council on 28 July. A radioisotope thermoelectric generator, or RTG, aboard the rover produce electricity from the radioactive decay of plutonium carried to Mars on the spacecraft. The power source degrades a few percent each year, according to Vasavada. Specific activities that require large amounts of electricity, such as long drives and use of Curiosity’s ovens which heat up soil samples for scientific examination, may have to be spread out over multiple days in the future as the power levels run down. Curiosity also has more demands on its power source than other plutonium-powered probes, such as NASA’s Cassini spacecraft and Voyager missions. The extreme temperature swings on Mars require the rover to control its temperature with thermal control loops that pump fluid through the spacecraft, and Curiosity also carries survival heatters. 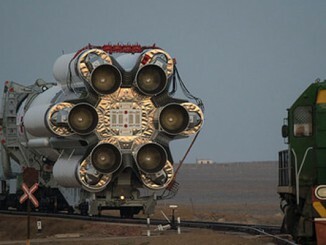 “Even so, we expect to have enough energy for survival for at least 10 years,” Vasvada told Spaceflight Now on Thursday. Curiosity completed its two-year prime mission phase in 2014. Rover managers plan to propose another two-year extension to Curiosity’s operations on Mars next year. Further extensions, if approved by NASA, will also come in two-year increments under the agency’s senior review process. Curiosity arrived at the base of Mount Sharp, a peak the size of Mount Rainier at the center of the rover’s landing site at Gale Crater, in September 2014. The robot’s first stop at the foot of the mountain is in a geologic deposit named the Murray Formation, thought to be near the boundary between separate rock units comprising Mount Sharp and the floor of Gale Crater. Farther up the mountain, Curiosity will encounter a ridge that shows the chemical signature of hematite, a clay-bearing mineral that forms in watery environments, in data obtained from Mars orbit. A stretch goal for the rover is to make it to a boundary between clay and sulphate geologic units believed to be between 6 and 8 kilometres (4-5 miles) ahead. “If we get to this boundary of the sulfate-clay area, that’s how we’re sort of timing our mission,” Vasavada said. 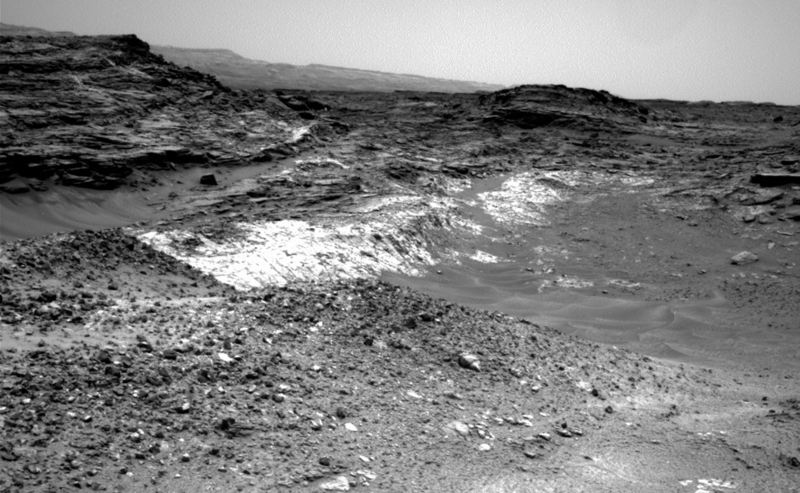 As of this week, Curiosity has logged 11.1 kilometres (6.9 miles) of driving since it landed in 2012. 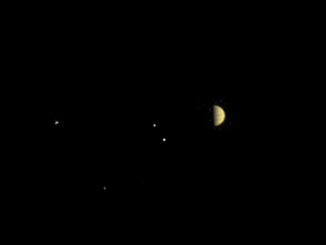 The visible camera on NASA’s Juno spacecraft is capturing a time-lapse movie of Jupiter and its four largest moons as the orbiter dives toward the giant planet for a 4 July rendezvous, and officials have released a first taste of the views armchair scientists and space enthusiasts can anticipate over the coming weeks and months.